BOOK EIGHT: CHAPTER . XI: "Elephants breed in that part of Affricke which lyeth beyond the deserts . India bringeth fouth the biggest: as also the dragons that are continually at variance with them, and evermore fighting, and those of such greatnesse, that they can easily claspe and wind round about the Elephants, and withall tye them fast with a knot. In this conflict they die, both the one and the other:"
"the Elephant hee falls downe dead as conquered, and with his heavie weight crusheth and squeaseth the dragon that his wound and wreathed about him." CHAPTER XII: "...the dragons ware hereof, entangle and snarle his feet and legges first with their taile: the Elephants on the other side, undoe those knots wiht their trunke as with a hand....the principall thing the dragons make at is the eye . Now these dragons are so big withall, that they be able to receive all the Elephants bloud. Thus they are sucked drie, untill they fall down dead..."
CHAPTER XIIII : "Megasthenes writeth, that there be serpents among the Indians to that bignesse, that they are able to swallow stags or buls all whole . 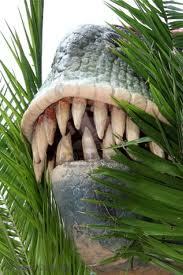 Attilius Regulaus, generall under the Romanes, during the warres against the Carthaginians, assailed a Serpent neere the river Bagrada, which caried in length 120 foot..."
COULD IT BE THAT DINO'S AND MAN ACTUALLY LIVED ALONGSIDE ONE ANOTHER , and very recently ? Did these artists witness these animals for themselves ?